Festive mint cheesecake (all dressed up in green for the season) full of bittersweet chocolate chips, topped with rich chocolate ganache and a swirl of mint. STANDARD SERVICE: Orders placed Sunday through Wednesday by 11:00 am Central Time will be delivered the same week. Orders placed Wednesday 11:01am through Saturday midnight will be delivered the following week. Product is shipped in the continental United States. Shipping cost is $16.95. Please call for delivery and service to Hawaii and Alaska (800) ELI-CAKE. PRIORITY DELIVERY: Orders received by 11:00 am Central Time will be delivered in one business day for $30.95. 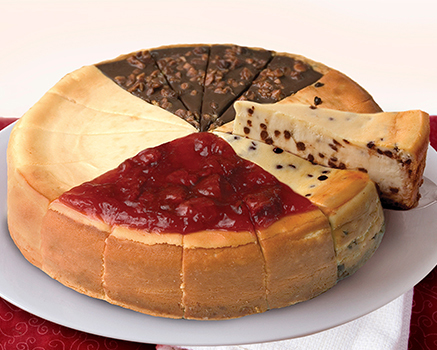 Frozen: Eli's Cheesecakes can be stored frozen at zero degrees (0F) for up to 9 months, tightly wrapped.Refrigerated: Once thawed, Eli's Cheesecakes can be stored covered up to 5 days in the refrigerator. Ingredients: Cream Cheese (Pasteurized Milk and Cream, Cheese Culture, Salt, Carob Bean Gum, Guar Gum), Sugar, Sour Cream (Cultured Nonfat Milk and Cream, Corn Starch, Whey, Guar Gum, Carrageenan, Carob Bean Gum, Enzymes), Chocolate Chips (Sugar, Chocolate, Cocoa Butter, Butterfat [Milk], Vanilla and Salt), Egg, Wheat Flour, Butter (Cream, Salt), Whipping Cream (Cream, Carrageenan), Powdered Sugar (Sugar, Corn Starch), Chocolate Mint Flavor, White Chocolate (Sugar, Cocoa Butter, Milk, Nonfat Dry Milk, Soy Lecithin as Emulsifier, Vanilla), Invert Syrup, Cocoa Processed with Alkali, Egg Whites, Salt, Natural and Artificial Colors (Turmeric, Polysorbate 80, FD & C Blue 1), Stabilizer (Gum Acacia, Propylene Glycol Alginate, Xanthan Gum).